Sderot Hesder Yeshiva Dean Rabbi Dovid Fendel spoke to Arutz Sheva about Deputy Foreign Minister Tzipi Hotovely's remarks, and the criticism they drew. 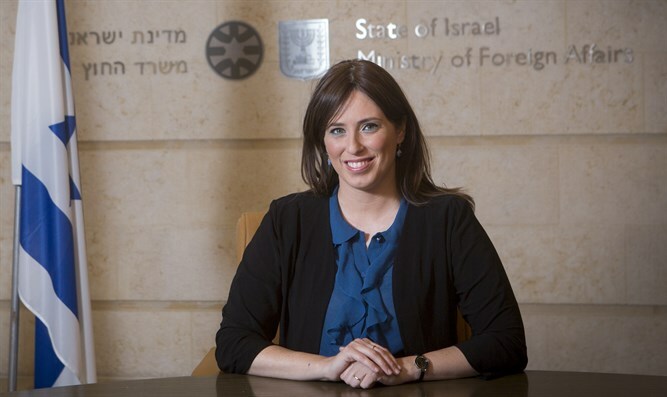 In the last 3-4 minutes of her 15-minute interview on world issues with i24, Hotovely said that the Western Wall conflict was a political issue, and noted that US Jews do not fully understand the realities of life in Israel. According to Rabbi Fendel, Hotovely's words were "spoken with grace and with compassion, out of faith and humility. She did not attack US Jewry, and did not insult them, either." Rabbi Fendel was born in the US and immigrated to Israel at age 17. He suggests the leftists attacking Hotovely "listen well to her words, which have meaning, a vision, and a very strong message for our brothers in the Diaspora." "Hotovely said clearly in the interview that she would be happy to give up her position if the US Jews decided to move to Israel and vote against her in the elections," he emphasized. "That is a very brave and honest statement." "She also said the Western Wall conflict is not a conflict amongst the general public but between political leaders, and is an attempt to gain political power. This is not a public dispute among those who come, naturally, to the Western Wall - a place of worship which unites, not divides. If this were truly a battle between members of the public, both sides would be visiting the Western Wall en masse. What Hotovely said is true, and is not an insult." Regarding Hotovely's remarks about the comparative ease of American life, Rabbi Fendel said, "She said honestly that perhaps young American Jews have forgotten or do not know the terrible reality of the period in which Jews had no country of their own." "No matter how old you are, it's difficult to understand how young Jews can cut themselves off from Israel. Hotovely told the truth: Sometimes, when you're removed from the challenges of Israel's daily existence, it can be difficult to connect to the unique realities of life in the Middle East." "Obviously, Hotovely did not intend to insult the wonderful people living in the Diaspora. I suggest there be a deep, not superficial, discussion of the matter, without anyone holding onto a prepared list of defenses in order to slam the government and the right of others to think and express themselves." Rabbi Fendel also noted that Hotovely continuously invests in her relationship with US Jews, and only recently returned from a trip in which she visited Jewish communities and colleges throughout the US. "She is the one who chooses to meet with young adults, to hear them, and to bring them Israel's message," he said. "As someone who was born outside of Israel, I remember how for years we would only hear non-observant, even anti-religious, leftist representatives of Israel, and we did not understand how they could be the ones representing the Jewish State. But we listened respectfully, because they came from Israel and represented a sector of that society. Hotovely is doing her job, and she is working to strengthen Israel's connection with the Diaspora." Rabbi Fendel also noted that the leftist head of the local Hillel canceled a speech Hotovely was scheduled to give in Princeton University, and wondered aloud where Hotovely's critics were when her speech, given in Chabad House instead, was canceled. "When the Deputy Foreign Minister is not allowed to speak to university students, that is the occurrence which should be condemned," he concluded.